At the National Portrait Gallery recently, as I wandered through the Victorian and Twentieth Century and Contemporary Galleries, I realised that I was surrounded by all the most amazing people who have moved or inspired me or touched my heart, during my lifetime. Iris Murdoch, Virginia Woolf, Vanessa Bell, Malala and Queen Victoria: yes a mixed bunch, but each one of them has inspired me in her own individual way by her courage, or her defiance of convention, or her spirit or her genius. It is truly a moving experience to gaze upon the faces of each of these people, and to reflect upon the impact each one of them has had on my life. Some of them look very unexceptional; others have been portrayed in a way which truly conveys their individuality. But what all have in common is this: they are like a cloud of witnesses, a gallery of masters who have found their way into my heart and mind over the generations and seasons of my life, through something they’ve written, or painted, or thought, or expressed. To gaze upon their faces, even imperfectly rendered – for how can I tell the accuracy or the insight of the artist, having never encountered the sitter in person – is to be deeply touched. I’ve just spent a week in London, near the Tower, and my mind is full of London stories… stories of many different aspects of life in the city. First of all, I think of the tales we were told on the walk from Whitechapel tube station, the Hidden East End walk, led by one of London Walks’ brilliant raconteurs. and stories of the disabled ex-sailors, some as young as 12, who were looked after according to a strict regime in the Royal Naval Hospital, Greenwich. I have in mind the magnificent and privileged, those in Anglo Saxon times who were important and wealthy enough to leave precious time capsules for the British Library to display centuries later in their Anglo Saxon Kingdoms exhibition: the magnificent, the scholarly and the gifted: kings, monks and abbots. In my next few blog posts I’ll have more to say about these and other individual strands of London life, but for now let it remain a brief survey of a rich and complex tapestry. Over Christmas a biography came to me which is one of the most compelling and moving accounts I have ever read. Out of the Forest (published by Penguin Australia) is the memoir of a man who spent ten years living as an alcoholic drug-crazed recluse high in the New South Wales forest, (with occasional forays down the mountain to the local hippy community to sell his crop of marijuana, and spend his income on alcohol). This man now holds a PhD and is an academic at the Southern Cross University at their Lismore campus in New South Wales, where he teaches Social Sciences. His name is Dr Gregory Peel Smith, and his story takes him from a severely abusive childhood and period of torment in a Catholic orphanage, through years of mental suffering, self-destructive behaviour, alcoholism and drug addiction and self-imposed isolation, to his present life. And the way in which Gregory rehabilitates himself, upon emerging from ten years in the forest, is deeply moving and inspiring. Although later on he is greatly helped by certain individuals whom he identifies as angels, in the early stages he transforms his life solely through his own inner resources. He describes in detail his method for “mounting a mental counter-insurgency” against his inner demons which I believe would be immensely helpful for anyone who has gone through any experience approximating to his kind of mental suffering and turmoil. Though his case was extreme I believe it will be of great value to many, and not only those who have been through comparable extreme experiences. Naturally I highly recommend this book, and not only to a general readership but to those interested or engaged in psychotherapy and personal spiritual transformation. The Christian faith rests on the awesome truth of several supernatural events – the Virgin Birth, the Incarnation, the Transfiguration, the Resurrection and the Ascension – and last year, I watched again “The Nativity”, the TV mini series first broadcast by the BBC at Christmas 2010. I remember the series had a strong impression on me when I first viewed it and we could hardly wait for each new episode. Seeing it as a continuous story was a different experience from viewing it in episodes; I found it much more challenging and harrowing, especially the scenes in which Mary is judged and reviled both by her fellow villagers in Nazareth, and by householders and innkeepers in Bethlehem. Tatiana Masleny and Andrew Buchan both gave brilliant performances as Mary and Joseph and I must confess John Lynch came over as a very handsome and rugged Gabriel. Here’s a Youtube link to a beautiful and moving song by Kate Bush with clips from The Nativity film. Seeing this very realistic re-imagining of the Nativity story again, I realised afresh how divisive the story is, for all those who engage with it, whatever they believe. To see Mary portrayed like this when she has been so revered by Catholics over the millennia with titles like Queen of Heaven and Mother of God, is certainly very challenging. And it leads me to reflect again on the assertions of Christian theology, most notably the question of how God could have chosen to bring his Son into the world by causing Mary so much suffering … huge issues arise from this, and provide much material for argument and discussion. Once again this brings up the question that many have struggled with, of why Jesus could not be the son of God and also born naturally by Joseph. I thought this portrayal of the story has the power to strengthen and enhance the faith of the viewer by the honesty and realism of its portrayal. But how you respond does of course depend on the stance you choose to take before coming to the story. Certainly I remember the leader of our group at an Alpha course a few years ago beginning the discussion by expressing an inability to believe in the virgin birth. But in this film version, we see Joseph as key. His ability to wholeheartedly believe what Mary was telling him, saved her from the judgementalism and hatred and rejection of all those around her – which, without the protection of Joseph, may even have resulted in her death before Jesus was even born. This gives us much to reflect upon. I’m looking forward to being part of the Christmas Market at King Edward VI School in Stratford-upon-Avon on Saturday 8th December 2018 from 12.30-3.30pm. This was the school where Shakespeare studied in the famous Schoolroom between the years 1571 and 1578. So he won’t be at there in person but he may well be in spirit; for he was fond of revelry, and so were some of his most famous characters, Falstaff among them. Having exhibited and sold my books at this fair in previous years I can promise there will be music, fun, a festive atmosphere and a fantastic raffle ( which I must admit does carry the best prizes I’ve ever seen at events of this sort). 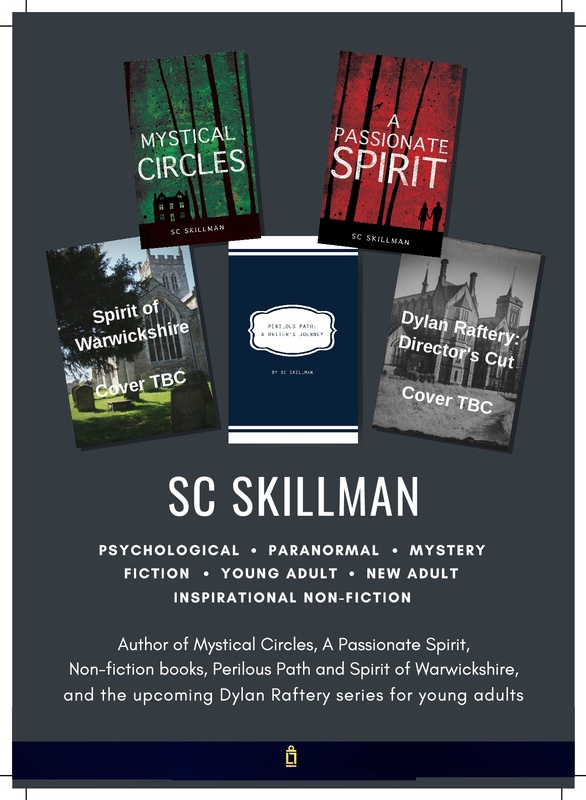 So if you are in the Stratford-upon-Avon area this weekend do come along to the Christmas Market, enjoy the revels, soak up the atmosphere, browse the stalls, and come and have a chat at the Local Author stand, where I’ll be signing and selling my paranormal thriller suspense novels. The first time I ever heard of Nanowrimo (National Novel Writing Month) I was incredulous; I thought it a crazy idea. How on earth do you write a novel in a month? Then, as I investigated further, I realised that it’s actually a handy motivational tool to get that first draft of your novel written. Currently I’m working with Nanowrimo to complete the first draft of my new novel “Standing Ovation” (the second in my YA Dylan Raftery series). National Novel Writing Month is currently in progress, and I’m again taking this challenge – completing the first draft of my new novel. Here is an article I wrote when I was 3 weeks into the 2011 challenge, in order to write the first draft of my second novel “A Passionate Spirit”. Everything I said then still applies now; and my extra challenge is to take my own advice! I hope some of you who have set out on this challenge again for 2018 will find it a source of inspiration. 1) Do your preparation work before the month begins. Ideas will have been hatching in your mind for the last couple of years, perhaps; and now you have a ground plan. You have created a one-sentence storyline, and expanded it to a blurb and a synopsis and perhaps you have drawn up a list of scenes for your novel. Not everybody needs to have done this before they begin writing the novel. Some like to plunge into the writing with two or three characters and a conflict in mind, and let the story emerge. But I had already been thinking about my characters for a year or so before beginning my novel. And I know from experience what it’s like to allow your characters to take over. Characters will do that anyway, even if you have a plan. But I now believe having a plan is a very good way to start, even if the plan is radically changed by the time you’ve finished your first draft. 2) Begin writing, and don’t go back to edit. Control your desire to look over previous chapters and assess or improve them. This needs great discipline. Just keep writing even if you suspect what you are writing is rubbish, because you are going to go back over your manuscript anyway after the month is up and use it as the basis for your second draft. 3) Don’t fall into the trap of slacking or subsiding or falling away because your novel feels as if it’s sinking in the middle. Introduce something crazy or bizarre that occurs to you; just follow that instinct, introduce it into your plot, set your characters the task of dealing with it and keep on writing.